This is the box. They say you get 5 "Great" Nail Colors, 2 Nail Treatments, and 4 manicure tools. Cool, I'm with you. I honestly am not expecting much, but the idea of "grab bags" and "mystery prizes" has always enticed me. You get a thrill opening them up not knowing what you'll get. This brown box. Hello brown box! Please provide me with some pretties! Well, no special rare gems in this pack. I do think it is an improvement from when Scrangie got her set in December 2008. The bottles have labels, you don't get sheer pinks, or falsely labeled colors that are really clear. There are some rich colors in here. Rare or original colors? Not at all. I'm sure we all 3 versions of these colors. They're your standard wine, maroon/brown, and magenta. The nail pen? Meh. I'm not into nail pens. I'm actually glad I got the white polish. I use that for frankening and I was out. I would of been better off spending $1 on WnW White rather than this though. As for the colors, these will probably become franken projects. The treatment pen I was excited about. I twisted the pen about 100 times before any product came out. I actually think this one is nearly empty? 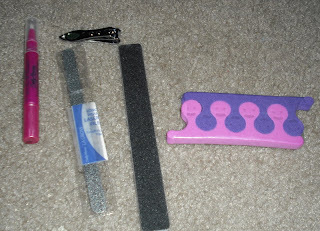 The metal nail file scares me. I don't know how to use this. The regular nail file I probably could use. The toe separators with happy faces on them give me the creeps. Don't even bother. If you're looking for one of those rare polishes, don't count on getting one. I guess if you really are eager to find a rare polish and think it's worth $10 then go for it. I hate these things because since they're a mystery you have the urge to keep looking, but don't waste your money. Out of all the things I got..I am not thrilled, excited, or even content with any of it. On a scale of 1-10 I would rate this stuff a 1. The only valuable thing about this stuff is now I have some polishes to franken with. 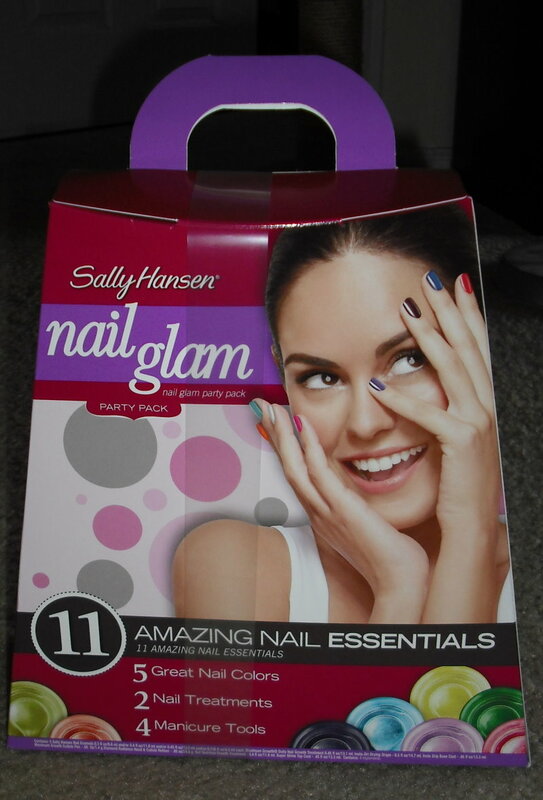 I could of bought 10 WnW $1 polishes in the colors I wanted for the same price of the set of this worthless crap. I should of listened to Scrangie and my instincts telling me "Steph you're going to get box full of ****" I sure did! UPDATE: Perhaps I got the wrong set. After I typed this post up I saw this post by Beautyburg. I think in these sets you can see beforehand what you're purchasing...Dangit...I wish I would of waited a day. I love your new Christmas light background! You got better colors than another one I saw. Just think of it as stuff to use for the Zoya trade in June! Thanks for the shoutout! I think you made off better than Scrangie! But it's still false advertising. Look at the bottles on the box and the skittles!!!! You do get a lot of stuff (love the cuticle pen). I posted about this as well and was quite disappointed with what was in mine. 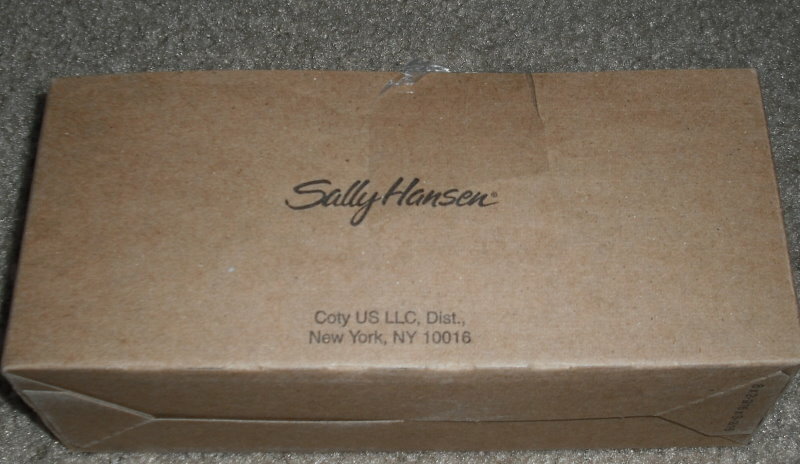 Old discontinued products mostly. They really got us though, didn't they? 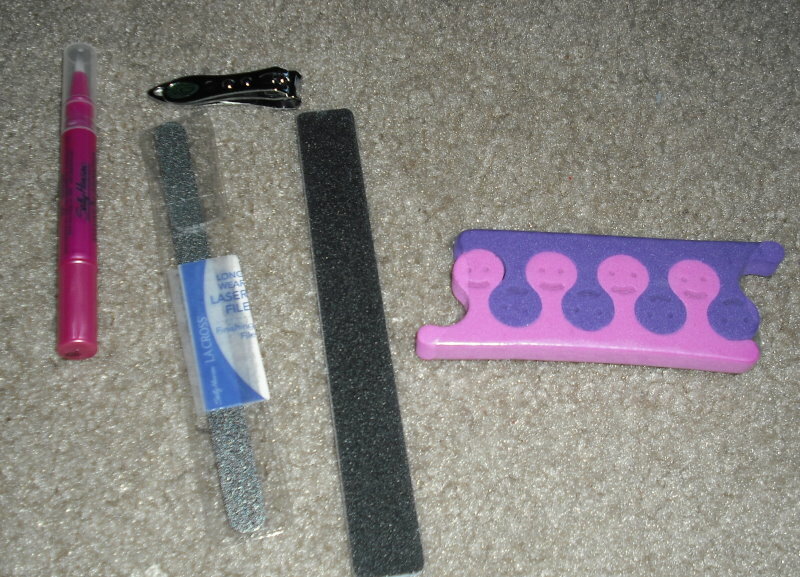 At least you got distinct mani tools - I got two sets of those silly toe separators a double insult! polishedlyrics- You are so right. My $ tree never has good stuff, but I probably would of been better off. I didn't have my head on right when I purchased this. Glad you like the background! Applepark- I agree it is false advertising, but I should of known better. I hope I can find that set you got! ABOP- I know they really did get us :(. Try those Lacquer Shines, you might like them after all. I've been buying them off of ebay on purpose because I love them so much. Glossy is black with red glitter, like Lubu Heels. It does look maroon when you first see it though. I wish you had gotten Radiant, Dazzling, or Luminous. Those are some of my favorite polishes in my entire stash. I also have Wine Not, and it's a pretty color too. I don't think you got $10 worth, but it's also not a total loss compared to poor Scrangie, man, she got screwed!